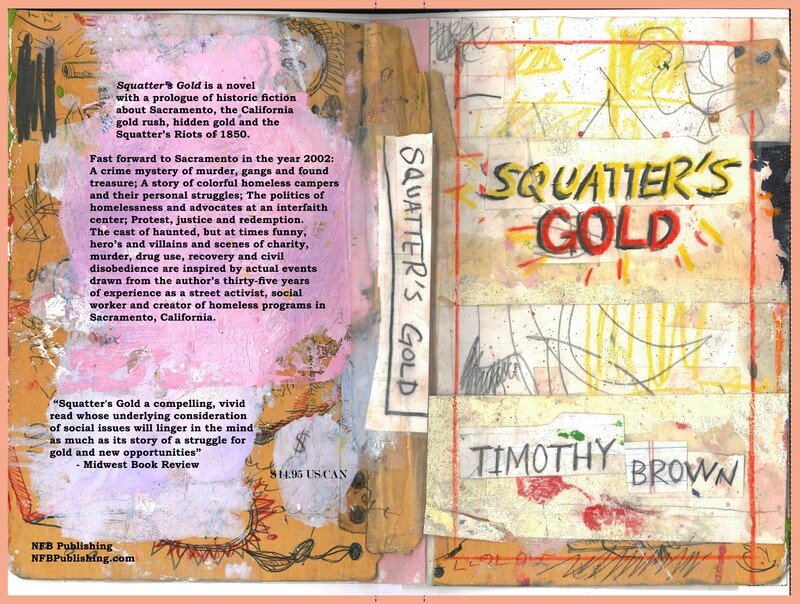 “Squatter’s Gold” a debut novel of fiction by long-time Sacramento homeless and affordable housing advocate Tim Brown, was published in July 2018 by NFBPublishing.com. This Sacramento story of homelessness, treasure and murder begins with an historic prologue about 1850 Sacramento, the gold rush and the historic Squatter’s Riots. The story then jumps to Sacramento 2002: A crime mystery of murder, gangs, and found treasure. A story of colorful homeless campers and their personal struggles; the politics of homelessness and advocates at an interfaith center; protest, justice and redemption. The cast of haunted, but at times funny heroes and villains and scenes of charity, murder, drug use, recovery and civil disobedience are inspired by actual events drawn from the author’s 35 years of experience as a street activist, social worker and creator/manager of homeless and housing programs in Sacramento, California. Author Timothy Brown is a former Executive Director of Sacramento Loaves & Fishes and the former Director of the Ending Chronic Homelessness Initiative (A Sacramento City/County collaboration which cut chronic homelessness by over fifty percent in just four years, 2007-2010). There will also be a book reading/signing event on Saturday, October 20th from 5:00 to 7:00 pm at Luna’s Cafe located at 1414 16th Street in Sacramento. Squatter’s Gold is Book 1 of the ‘Sam White Homeless Mysteries’ series, introducing a historical novel based on the experiences of a successful 1850 California Gold Rush prospector, Sacramento’s historic Squatter’s Riots, and the legend of lost gold hidden in a tree. With such diverse roots in reality, it seems a no-brainer that a story based upon these events would be engrossing, and Squatter’s Gold lives up to this expectation with a fast-paced, multifaceted plot that keeps readers enthralled and involved right up to the end. The first thing to note about Squatter’s Gold is that its timeline moves unexpectedly between 1850s California history and events to modern-day 2002, where homelessness in the state’s capital city is rampant. It’s unusual to see a historical background paired with a modern urban mystery, but Timothy A. Brown deftly pulls off this marriage of timelines in a production that will attract the very different audiences of history buffs and readers interested in the social issues of poverty and homelessness. The central character is a social worker who is anything but an investigator, but who finds himself drawn to past and present in an unusual manner. At this point it should be pointed out that readers who pick up Squatter’s Gold anticipating either a Gold Rush adventure or a hardboiled mystery will find that this mercurial story is neither; yet embraces some of the drama and trappings of both. While readers of formula and genre productions who seek entertainment value alone might chafe at the additional depth and social perspectives offered in a leisure read, the result elevates the entire production beyond the usual confines of a singular genre choice to create an engrossing series of encounters that send Sam on a treasure hunt beyond his wildest dreams as a social worker. As threatening notes, homeless community interrelationships, and violence emerge, Sam finds his job moves into street encounters and efforts to save a legendary treasure and vindicate a man’s death over its discovery. Readers who like their stories firmly rooted in a sense of place (in this case, California’s Sacramento) and a sense of purpose (Sam’s newfound efforts to make a difference in the lives of the homeless) will find Squatter’s Gold a compelling, vivid read whose underlying consideration of social issues will linger in the mind as much as its story of a struggle for gold and new opportunities.